The Long Island Sound is an estuary of the Atlantic Ocean. It is in the United States. 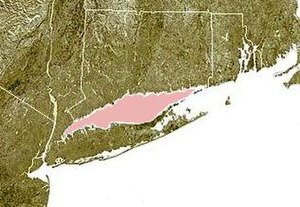 The US states of Connecticut (to the north) and Long Island, New York (to the south) share it. The Connecticut River at Old Saybrook, Connecticut connects to the sound. To the west, The Bronx and Westchester County, New York connect to the East River. To the east, the Block Island Sound connects to the sound. This page was last changed on 4 July 2017, at 05:57.